Movie canvas prints. Design a personalised photo montage. 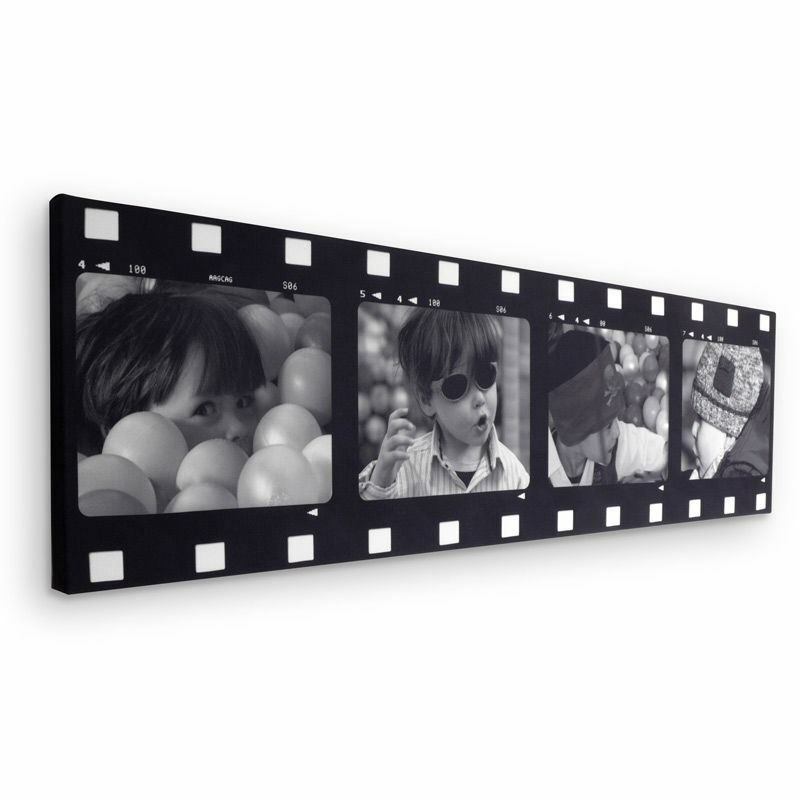 Merge a contemporary design with a vintage look to create an iconic film strip photo frame canvas print. Using your digital photos and a classic Hollywood film strip design, you can bring a sense of excitement and cinematic drama to your home. The retro design frames your photos beautifully, resulting in a dynamic movie canvas print which makes a stunning addition to any room. Give your special photos or artistic designs a unique touch with this brilliant personalised photo montage canvas. 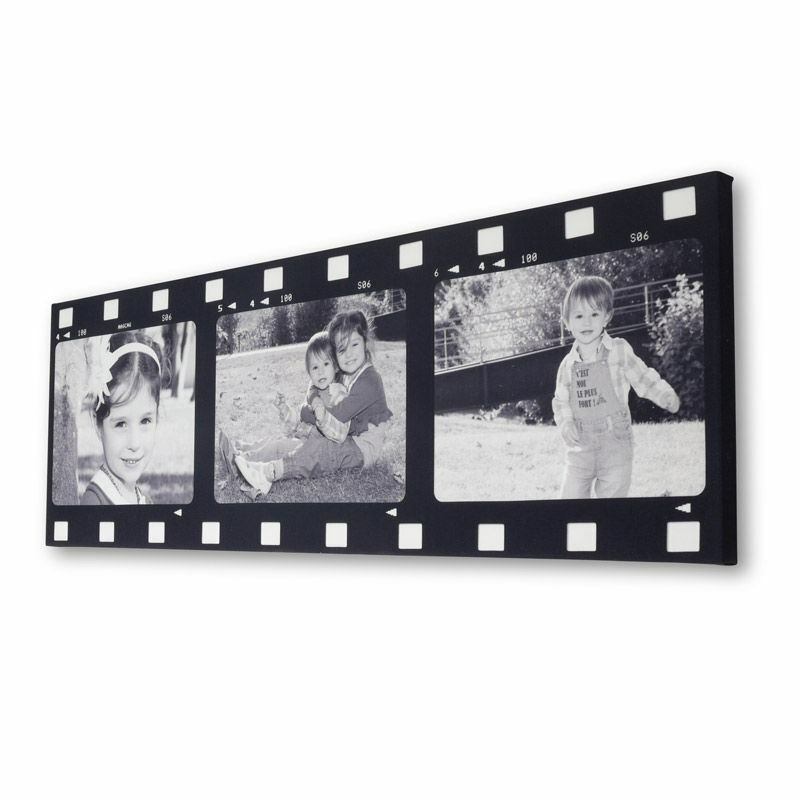 Combine digital photography with an iconic cinema film strip frame to design a vintage style photo print, which brings an element of magic to any home. Choose from 2 to 7 segments in the frame for multiple photos, perfect for capturing special family moments and events. Using a professional quality printing process, we produce long-lasting and vivid prints which are then stretched onto hand-crafted sustainable pinewood stretcher frames. All our film canvas prints are custom made on site in the UK to ensure the highest quality pieces, and each comes with a lifetime guarantee. Whether you opt for dramatic black and white for a vintage feel, or colour for a fresh and vibrant look, easily design your movie canvas print using our online design tool. Upload your photos and use the template to experiment with creative designs and find the look that’s right for you. Our design tool gives you full control over your designs, even giving you the option to add filters or text. Select from two to seven photo segments on each film canvas print, starting from 60 cm x 30 cm for one segment, to 200 cm x 30 cm for seven. If you opt for one to five photos, your film canvas prints will come in a depth of 2.5 cm. This standard depth is robust whilst also being lightweight, and elevates your prints off the wall beautifully. For larger personalised photo montages, the frame will be created in a depth of 4.5 cm. A greater depth gives your larger design extra support, keeping it stable and sturdy. A slightly textured finish on our 300 gsm canvas gives your film strip photo frame print a gallery quality style. We use 100% poly which beautifully preserves your designs, and remains strong over the years. This heavy, durable fabric won’t weaken like pure cotton canvas. Your movie canvas print will be displayed on a high quality, long-lasting and robust frame. Our makers craft the canvases on site, using sustainably sourced pinewood which is FSC certified and laminated for extra protection. Your professionally made frame won’t crack or split over time and is knot-free to prevent warping. After creating the canvas frame, your print will be hand-stretched to create a perfect tension. We opt for a superior printing method to showcase your designs in the quality they deserve and keep them looking fresh throughout the years. Rather than using inkjet printing which simply lays ink on top of a canvas, we use sublimation dying. A combination of heat and pressure locks the inks directly into the fibres of the canvas fabric, ensuring they won’t budge and are completely scratch-proof and even washable. Your film strip photo frame print will have a matt finish with a gentle grain, with no shiny coatings on top. Expect striking colours, an even, continuous tone and spectacularly sharp detailing. Alongside our sustainable wooden frames, we also use environmentally friendly ink. The 100% solvent free dyes will give you peace of mind as well as being incredibly long-lasting. To preserve the vibrancy of your design, please keep it away from direct sunlight. The wrap of your film canvas prints is what appears on the sides of the canvas. We offer a range of different wrap options, such as mirror or gallery wraps where the image is reflected or extended over the frame edges. You can easily select the options once you press “Start Design”. For a simpler look, you can select a coloured wrap or no wrap. Check our design tips below for more information on choosing that all-essential wrap. Every canvas you purchase comes complete with a ready to hang wall hanging kit. The kit includes picture hooks, screws and wall plugs – just attach the picture hook to the back of your personalised photo montage canvas, and hang with ease wherever you please. Enhance your personalised photo montage by selecting the perfect wrap for your design. Because the film strip photo frame borders the design, it’s possible to have either a gallery or mirror wrap without losing any important parts of your image. By extending the black border even more focus will be drawn to your personalised photo montages. Alternatively, you could select a colour wrap which compliments your chosen images. Select the colour you’d like, then place your photos directly into the template. Landscape photos work best in our movie canvas templates, as they fit the 4:3 ratio of each area better than portrait orientation images. Film canvas prints are a perfect way to capture a series of snaps from a special event such as a graduation or wedding. You could display a photo of your daughter going up on stage, with the next showing her receiving her degree, followed by a photo of her standing proudly with her certificate. Alternatively, they’re a great way to showcase multiple photos from a family holiday when you can’t decide which ones you’d love to get printed! If you’re a film buff, why not try designing a Hollywood style personalised photo montage? Upload stills from your favourite movie scenes and then customise it to your heart's content. Why not create a series of black and white vintage-style film canvas prints, to give a unique style to your living room? Upload your photos and use our online filter to transform your photos into black and white. Two or three of these designs will bring an authentic Hollywood cinema style to the room, and give your family photos a fun look! If you’d like to add even more images to your movie canvas prints, you can easily add photos using our montage option in the online design studio. Choose from a variety of styles to display your photos, such as having them scattered over a blurred background within a photo segment. It’s a beautiful way to make the most of your new canvas print. Why not deck out your home with multiple movie canvas prints? Take advantage of our special offer; when you buy two film canvas prints, you’ll receive the third completely free. The discount will be automatically applied to your basket when three film canvas prints are added. Your movie canvas prints are created to last; we want to ensure you remain happy with your new print, so we offer a lifetime guarantee with every order.